The QD tour continued today. I was on my way downtown to pick something up when I drove by a Quality Dairy I hadn’t stopped at yet. I was thirsty and was already contemplating a Speedway stop for a Pepsi. Yeah, I could have got the Speedy Rewards points had I went to Speedway, but I would have had to go out of my way a little bit. 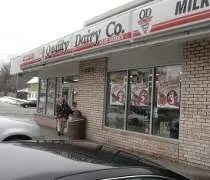 This Quality Dairy is on the corner of Pennsylvania and Kalamazoo Street. The address is Pennsylvania, but the front of the store faces Kalamazoo. It’s a small corner lot that is made even smaller with the gas pumps. There are a couple pumps which today, actually had gas almost 20 cents cheaper than any place else I passed. I should have topped off my tank, but that’s not me. The inside of the store is small and kind of crowded. It’s not one of the bigger, nicer stores. I found the fountain soda machine and grabbed a cup to get my Pepsi. Right behind me wa the roller grill items. How come those never look good to me? Anyway, I topped off my Pepsi and went to pay. The price wa $1.05. Not as good as a Circle K Polar Pop, but on par with everyone else. This shop is pretty typical of the Quality Dairy’s in the older neighborhoods. It has all the QD favorites, but the store is small and not nearly as nice as some of the newer ones. Who cares though? You can still get donuts, ice cream and an Arctic Freeze. and reporting! Keep up the very good works guys I’ve incorporated you guys to blogroll.